Elliniko refugee camp in Athens feels like the the end of the world, something you might expect to find in a post-apocalyptic novel or in the newest Hunger Games instalment. I spent 10 days working in Elliniko this May with a Dutch NGO called Boat Refugee Foundation [BRF]. 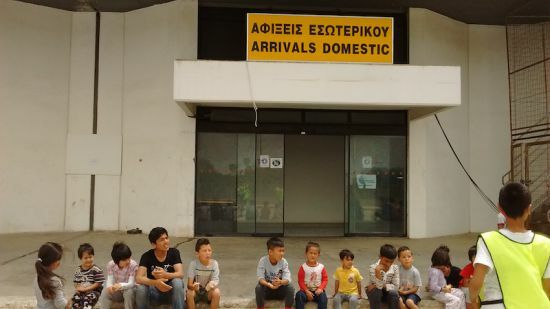 1,500 refugees, the majority Afghan, live in the domestic terminal of Elliniko Airport. The airport was a base for the Luftwaffe in World War Two. It closed in 2001 and has been derelict ever since. Not far from the airport, the Hockey and Baseball stadiums built for the 2004 Olympics are also refugee camps, housing 1,000 people each. All three buildings were once emblems of the height of modern civilisation. They give a very different impression today. The camp called “Arrivals” is the most shocking, and the irony is pertinent – families that have been trapped in Athens for months live under the signs for ‘Departures’, ‘Gates’ and ‘Duty Free Shops’. The 7pm flight to Santorini remains frozen on the departures board and children play on rusty mobile staircases outside. Pungent portaloos now line the approach to the terminal and tired clothes dry along fences or hang on faded adverts for Olympic Airlines. Food wrappers, plastic cups, broken glass and debris from the crumbling buildings scratch across the tarmac. Most refugees live upstairs in the airless terminal in tents of all shapes and sizes next to the boarded-up departures gates. Battered toilet cubicles and water fountains intended for busy passengers are now in constant use and leak onto the terminal floor. Surplus tents spill out onto the airport car-park, hugging what would have have been restaurants and cafes. “Johnny’s” hot-dog stand remains open by the entrance to the airport car-park and its red, cartoon branding is as absurd and surreal as the refugee camp itself. The majority of the people I met had been on the move for over six months. From Afghanistan, they had travelled through Iran, Turkey and the Greek Islands before ending up trapped in Athens. Their end goal is Germany or Austria, where many of them have family. (The older kids were so keen to learn their German numbers that we counted in German whilst playing with the skipping rope and ‘das ist gut’ was a popular refrain around the camp). 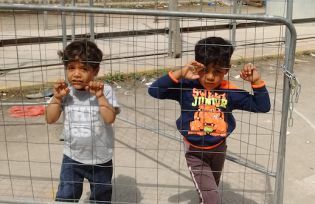 The refugees in Elliniko are mostly poor families with small children. Generally, single men and richer families stay with guest families in town, or can afford the next leg of their journey to the border by train, or try their luck with smugglers trading in Victoria Square in central Athens. BRF played with the children in “Arrivals” every day for two hours from 11.30, providing the only structure to an otherwise empty day. These children have not been in school for at least six months, the start of their epic journey. The girls may have never been to school. Many did not know how to spell their names, in Farsi or in English. We’d round up the children by calling ‘bia’ (come) and waving a mop so they could see where we were above the tentscape, then take them outside to play. Every day that we did this, I was struck by how many adults were asleep at 11.30 am. Inevitable, perhaps, when you have nothing to wake up for. Working with the children was the highlight of any day. We’d do a range of activities, from drawing and colouring-in, to skipping, football and volleyball. It was chaos. Look the other way, and the wooden boards needed as surfaces for drawing were being used as surfboards, the wheelie bin as a go-kart, and someone had drunk the soapy water from the bubble machine. Basketball descended into a game that looked more like rugby. We did a lot of drawing and colouring, especially with the younger children. Most drew pictures of houses, boats, or the hills of Afghanistan. All three were sad. Many of the children had noticeable behavioural problems and fights among the older boys (ages eight to twelve) escalated quickly and became violent. Violence is embedded in them from a young age. Several children had bruises on their faces where their parents had hit them. Despite having lived and played together for months, the children did not know each other’s names. Perhaps a sign of how divided the camps are. They were quick to learn ours, however. We would be mobbed on arrival and would have several children touching us, playing with our hair, kissing our faces, clinging to our hands, or tickling our tummies at any one time. A child psychologist volunteer explained that that this tactility is a sign of trauma and attachment issues. 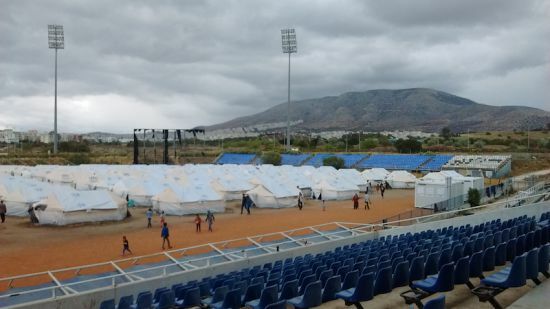 BRF’s other role at Elliniko was food distribution at the Baseball Stadium camp. “Baseball” is a ten-minute walk away from “Arrivals”, via a sleepy police checkpoint, and across the ex-runway, overgrown with weeds and rubble. In this camp, orderly UNHCR tents are snapped to a grid where the pitch once was, and refugees play cards, socialise, charge phones and boil kettles in the stands surrounding their homes. Each tent houses 14 people. Children career around the stands on a battered bicycle with flat tyres, fly kites made out of plastic bags, and slide down the bannisters of the stands. As far as I could tell, the camp is permanently floodlit at night, with bright lights glaring off white tents, giving the camp an eerie, spectral appearance. Tensions were high between different factions and fights were also common here, often provoked by a single comment. Breakfast would turn out a new cohort of bruised or bandaged faces from the previous night’s altercations. Ambulances would rattle up to the stadium regularly, and it was not always clear whether they were dealing with the aftermath of a punch-up, an accident with a camp stove or a faulty kettle, or treating a victim of the infectious disease (chicken pox) spreading through camp. The food was plain and unappetising. I arrived just after a hunger strike, where the entire camp had railed against the poor food, as well as the general conditions. A meal would consist of a small, damp cardboard box of lentils, potatoes, spinach or pasta (which is always ‘macaroni’ in Farsi, regardless of its shape), along with bread and oranges. Canned fish, chicken and biscuits were in high demand and most refugees declared that they were ‘mariz’ (sick) or pregnant in order to be eligible for whatever extras we might have. Even some men had doctors’ notes explaining they were pregnant. Despite the conditions they were living under, I was taken aback at the refugees’ dignity and gratefulness. Nearly all said thank you (tashako) and smiled at me when I handed over that evening’s miserable gruel, or helped correct my Farsi pronunciation of a number or food type. On a few occasions a smartphone would be pressed upon me so I could say hello to their relatives back in Kabul or Tehran, whom they were video-calling whilst queuing. The refugees had a great sense of humour – one of the fellow BRF volunteers spent an entire evening asking refugees if they wanted alaf (marijuana) with their meal. She had been misinformed and meant to offer them potatoes. On my last day another volunteer and I were invited to one of my favourite little girl’s home for lunch. In true Afghan tradition, they would not let us leave until we had at least three helpings of a delicious potato curry. They were a young family with no hope of getting out of Greece. The baby was still breastfeeding and the two little girls were four and six, with almost black skin and beautiful Mongolian eyes. I understood from our broken conversation that they hoped to go to Germany. Their cramped living space was immaculate, with the ‘dining room’ nestled between their two tents (one seemed to be a kitchen/storage space). The girls’ stuffed animals hung neatly from the ceiling, as did bags of toiletries and rubbish. As Hazaras, I knew they would have endured prejudice in Afghanistan. It was distressing to think how much more hardship and intolerance they will face in Europe. As we left, we met the husband’s eldest son, who explained to me that the husband’s first wife, his own mother, was living in a tent next door, with her children. He invited us to tea. Despite coming from a country that has endured more years of consecutive conflict than any other, Afghans are not recognised by the EU as refugees. They are ‘migrants’, perhaps because Europe can’t come to terms with the havoc they have helped wreak in Afghanistan. As a result, Afghan refugees can legally be deported back to Afghanistan. As many of the refugees I spoke to knew already, their time in Elliniko is limited. As part of a drive to clear the ports in Athens before the summer tourist season commences (nearby Piraeus doubles up as a huge Syrian refugee camp and Athens’ busiest tourist port), the Greek government are moving refugees to a new, purpose built camp in Malakasa, 25 miles north of Athens. I wish there were a way of tracking the progress of the amazing people and children I met in my time in Elliniko: from Mubina, the slightly disabled toddler with a permanently vacant look who attached herself to me every day, to Captain Burro, so named because he wore an army beret and always barked ‘burro’ (Go!) at the kids begging for extra juice at mealtimes, to the two Pakistani brothers who lived in “Baseball” among a sea of Afghans, to the only refugee with a colour photo on his meal papers (he laughed when I asked him why and explained that it was because he had been in jail), to Elias, always team captain at volleyball, and the family of four girls who were thrilled when I explained I had three sisters too…the list goes on. I have no idea what will happen to them and where they will end up. I suspect that they will be pushed back into Turkey, meaning that the money, time and effort they have spent, not to mention the trauma they have suffered, will have been in vain. Cecilia Keating is a freelance writer currently based in Montreal. She tweets at @ckeating14.